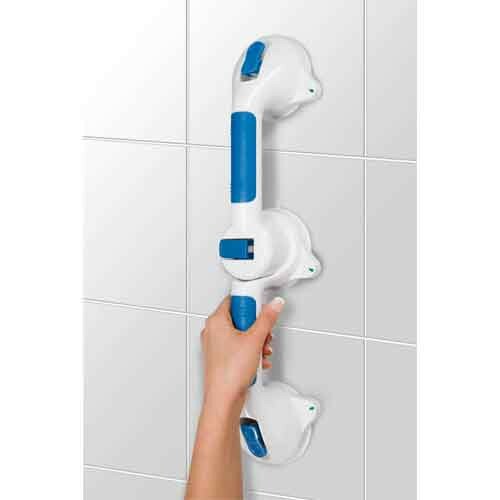 Grab Bar, BUY Shower Safety Aids, Safety Grab Bar, B20000, B19600, B19700. 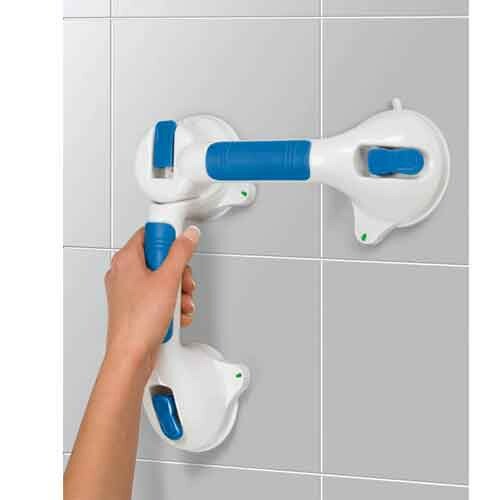 Ultra Grip Grab Bars, manufactured by Carex, provide safe, secure hand holds to assist in the shower and bathroom. Able to attach to most smooth, flat and non-porous bathroom surfaces, this grab bar can support up to 250 pounds when properly fastened. Protect yourself and prevent falls and accidents with the sturdy Ultra Grip Grab Bar. 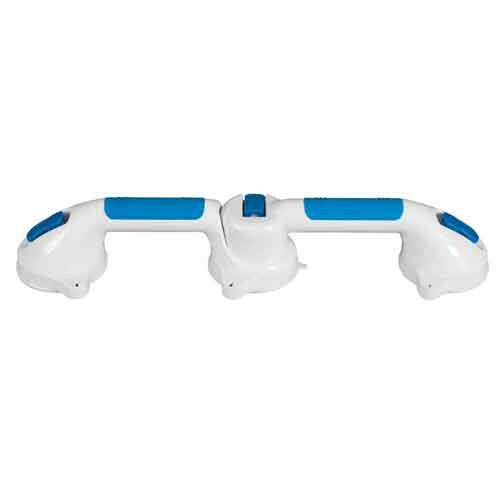 Most important to your safety, these Ultra Grip Grab Bars feature a reliable visual indicator so you know when the Grab Bars are properly attached. Powerful dual-locking suction cups fasten tightly and dependably. No installation is required, these Grab Bars are ready to go out of the box. Simply find a smooth, flat surface to help you in and out of the shower or bathtub. Available in 12 inch, 16 inch, and 19 inch with a third suction cup that can pivot for added versatility. Product Weight: 0.75 lbs., 0.86 lbs., 1.12 lbs. It says (Pivot) by the 19 inch grab bar. Could you please clarify what that means? I own the 12 inch grab bar and was going to buy some for an elderly relative. I don't know if one that pivots would be better or not? I'm not exactly sure what that means and how it Pivots. I'd appreciate any help you can provide. Thank you. The 19-inch model, which is not pictured, has a centralized pivot that will help a person reposition the grab bar without having to remove the entire unit.